Edson Cook was born in Circleville, Pickaway county, Ohio in 1845. Something happened to his father when he was a young child. According to the 1850 census, he was living with his mother at a cabinetmaker’s in Circleville. In 1860, he was working as a confectioner for R. Ball in Troy township, Richland county, Ohio and attending school. Despite his youth, Edson hurried to enlist at the outbreak of the war. He was enlisted into the 6th U.S. Cavalry by Lieutenant James Wade in Columbus, Ohio on July 22, 1861. His enlistment documents describe him as 16 years old, 5’ 1 ¾” tall, with brown hair, hazel eyes, and a ruddy complexion. Wade enlisted most of the regiment’s buglers, several younger than Edson. Edson was eventually assigned to Company I as a bugler, probably because of his age and size. He served there throughout the Peninsula and Antietam campaigns, and served with the regiment during a long cold winter of picket duty along the Rappahannock in 1863. The regimental rolls also show him as present for Stoneman’s Raid, Brandy Station, and the several cavalry fights on the march north to Pennsylvania. On July 3rd, the regiment was sent on a mission behind enemy lines to Fairfield, Pennsylvania to capture a Confederate supply train. When the command reached the town without encountering the train, Edson’s squadron was detached under Captain George C. Cram to search for it while the remainder of the regiment moved toward Orrtanna. A short time later, the squadron heard the sounds of gunfire. Judging from its volume that the regiment was engaged, Captain Cram turned his command and rode to the sound of the guns. They arrived to see the Confederates overrunning the regiment, and the two companies charged to the aid of their comrades. Vastly outnumbered, they were driven off with heavy losses. Riding at the head of the company, Captain Cram and his two buglers were very exposed. Captain Cram and Bugler Andrew J. Orm were both captured. Bugler Cook was killed, though initially listed as missing in the regimental rolls. 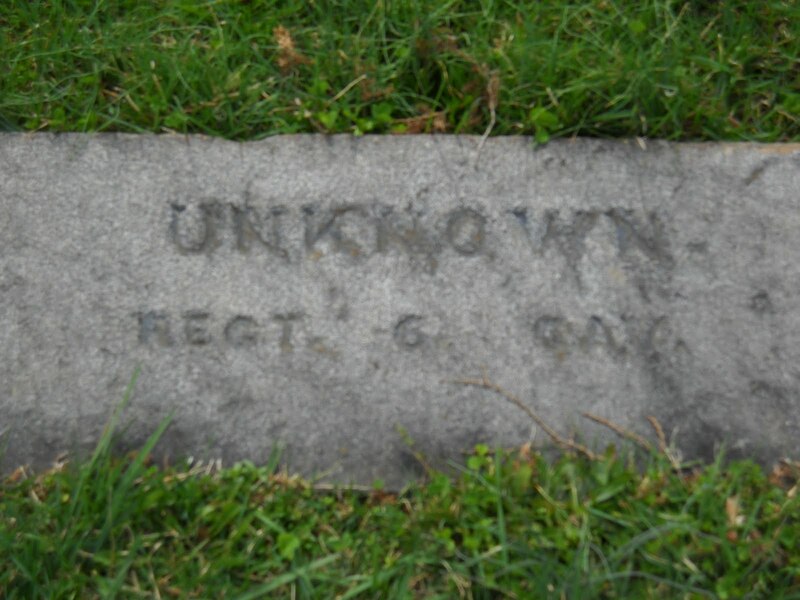 Edson S. Cook is believed to be buried in Gettysburg National Cemetery, in one of several graves marked for unknown members of the regiment killed there. His pension was claimed after the war by his mother, Ellen. Note: Cook is sometimes identified in records as Edwin S. Cook. William R. Reynolds was born in Laporte, Indiana in 1838. He spent his teenage years working on the farm of James Greenwood in Springfield township, Laporte County, according to census records. He was probably still working here at the outbreak of the Civil War, though he does not appear in the 1860 census. On June 19, 1861, William enlisted as a private in Company D, 8th Ohio Volunteer Infantry. The company was organized in nearby Norwalk, Ohio. He served with this unit for over a year, including the Peninsula campaign. During the battle of Antietam in September 1862, William was wounded. His regiment saw some of the heaviest fighting in the battle, suffering nearly 50% casualties. This was apparently enough of infantry life for William and many others. The following month, recovered from his wound, he transferred to the cavalry. Reynolds enlisted as a private in Company C, 6th U.S. Cavalry on October 23, 1862. He was sworn in by Lieutenant Albert Coats at Knoxville, Maryland, while his regiment was stationed at nearby Harpers Ferry. His enlistment documents describe him as 5’7″ tall, with light hair, gray eyes, and a light complexion. Private Reynolds survived the battle of Brandy Station unscathed, but was not so lucky the following month. He was part of Lieutenant Joseph Bould’s squadron at the battle of Fairfield, which served as the regimental reserve. Seeing the regiment being overrun by a charge of the 6th Virginia Cavalry, Bould charged with his squadron in an attempt to stem the tide. Unsuccessful, the squadron was routed and pursued. Reynolds was most likely killed in the charge or the ensuing pursuit. 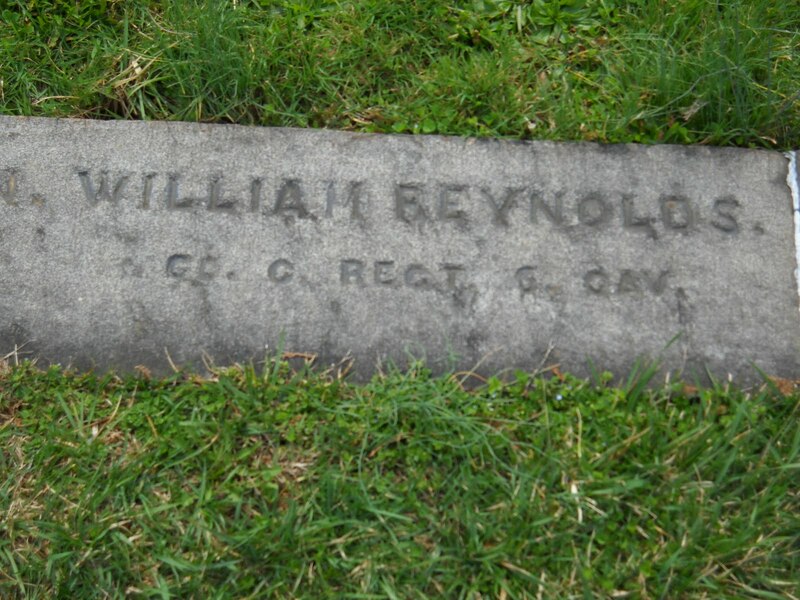 William Reynolds is buried in Gettysburg National Cemetery. I’ve decided to do a brief series on the soldiers of the 6th U.S. Cavalry who were killed at the battle of Fairfield, PA on July 3, 1863. The first of these is Sergeant John Pattinson of Company M.
John Pattinson was born in Westmoreland County, England. He immigrated to the United States with his family, settling on a farm in Pennsylvania. He was working on the family farm in Carbon creek, Erie County, Pennsylvania according to the 1860 census. He was enlisted into Company M by Captain Hays in Pittsburgh, PA on September 23, 1861. His enlistment documents describe him as 22 years old, 5’ 7 ½ “ tall, with brown hair, grey eyes, and a florid complexion. Pattinson earned promotion to Sergeant prior to the fight at Fairfield. He was wounded during the battle and later died of his wounds. 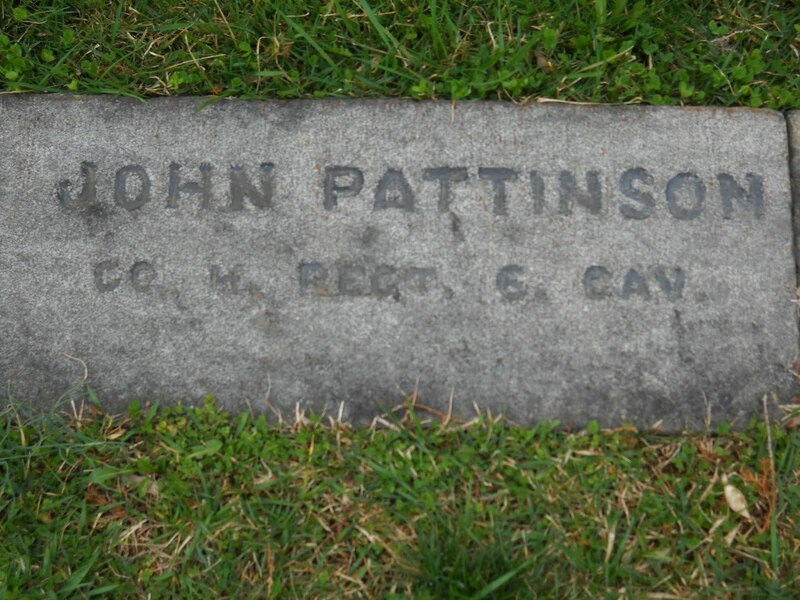 Sergeant Pattinson is buried in the National Cemetery at Gettysburg. In fairness to the 6th Cavalry, I went back over the weekend and found the report on the Fairfield engagement in the regimental muster rolls for July 3, 1863. The entry was made by acting adjutant 2nd Lieutenant L. Henry Carpenter and acting regimental commander Stephen S. Balk, the senior remaining officers with the regiment following the engagements at Fairfield and Funkstown. Incidentally, Eric Wittenberg posted an excellent biographical entry on him over on Rantings of a Civil War Historian a couple of weeks ago. I found it interesting that there was no mention made of the wagon train that caused the regiment to be sent to Fairfield, though whether this was because Lieutenants Carpenter and Balk didn’t know of it or intentionally omitted it due to limited writing space we can’t know. After reading JD’s article on the battle of Fairfield in this month’s ACW, a persistent question kept nagging at me. Why were the 6th Cavalry’s numbers so low at the beginning of the battle? A cavalry regiment at full strength was authorized 1063 troopers and horses by this point in the war. The campaign year had been relatively light on the 6th up to June 1863. They hadn’t participated in the battle of Kelly’s Ford on March 17, 1863, and their personnel losses during Stoneman’s Raid were relatively light. They were engaged at Brandy Station (total losses 67) and Aldie (total losses 9), but not Middletown (Middleburg? I’m on the road without references other than my notes, my apologies) or Upperville. So where did everybody go? The May 1863 muster rolls, compiled and signed on June 5, 1863, just four days before Brandy Station, offer some answers and insight into the regiment’s performance during the Gettysburg campaign. Personnel strength should not have been an issue. The rolls show 1072 personnel assigned to the regiment on June 5th, including a full complement of 42 officers. At full strength, even a lone Union regiment should have had a fighting chance against the Laurel Brigade at Fairfield if properly led. The true question is actually, where did everyone’s horses go? While the regiment was assigned over 1,000 soldiers, it had only 500 serviceable mounts. More telling, it had only 26 unserviceable mounts. Just over half the regiment, 546 personnel, were dismounted. They missed the June and July battles, remaining in the Reserve Brigade’s “straggler camp” in Dumfries, Virginia with the rest of the dismounted troopers. So the 6th Cavalry arrived at Fairfield with a strength of 500 mounted men, minus losses at Brandy Station, minus losses at Aldie, minus losses in stragglers and injured horses from the long march into Pennsylvania. Instead of over a thousand men, about a third of that went into battle at Fairfield. Also, due to the same lack of healthy mounts, losses in the previous battles were more serious than they initially appear on paper. The 6th U.S. Cavalry lost only 67 personnel at Brandy Station, apparently only a small percentage of its total strength. In fact, however, those losses are from 12 officers and 254 enlisted men who marched to the battle in five squadrons, according to Captain Cram’s report after the battle. The losses for the regiment were more than 25% of those engaged. Worse, four of the twelve officers present were casualties of one sort or another. Only nine personnel were lost at Aldie, but one of the severely wounded was 2nd Lt. Henry McQuiston, another officer. I believe the availability of officers was also a factor in the battle of Fairfield. Although assigned its full complement of officers, only 17 were present with the regiment at the beginning of the campaign. Of these, four were lost at Brandy Station and one at Aldie. Two of the officers present, 2nd Lt Chaffee and 2nd Lt Irwin, were commissioned only the month before. There were a few officer gains between Stoneman’s Raid and the battle of Fairfield. Two, 1st Lt Balk and 2nd Lt Chaffee, rejoined the regiment from duty at the dismount camp. Major Starr also joined the regiment from recruiting duty. Where are the other officers? Three were serving as generals of volunteers. Three more were leading volunteer regiments, and one, David McM. Gregg, was leading another brigade in the same division. Seven other officers were on the staffs of various general officers. Over half of the regiment’s 12 companies were led by lieutenants. One of them, Company G, had no assigned officers present and was led by a lieutenant from Company A.
I can’t help but feel that this absence of so many key leaders affected the regiment’s performance during the campaign. M ajors who should have been present with battalions and captains who should have been present with companies weren’t there. A regiment wasn’t intended to be fought by captains and lieutenants. This is not to say that those leaders present were not competent. Many performed at or even beyond the level that could reasonably be expected of them. Fortunately, many of the lieutenants had been sergeants and first sergeants of companies only months (in some cases weeks) before. But the organization of a regiment’s leadership was developed that way for a reason. I’ve long been curious why the Reserve Brigade was the first one sent through the Cavalry Depot at Giesboro Point when it opened in the late summer of 1863. If these numbers are any indicator, and the June returns for the 2nd Cavalry are similar, there may have been little choice.